At some point in the recent past, I realized that health is not just your physical body, but also your thoughts, your environment – in short everything. All things around tend to affect a person. It is just that some people are more sensitive and some less. 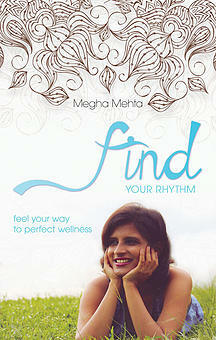 So when Megha Mehta and team contacted me to do a review for her book Find Your Rhythm, I decided to give it a try. Find Your Rhythm is a slim book, just 100 pages or so, and a very quick read. The author initially takes us through her personal story. She had a hard time accepting her body and kept fighting and struggling with it for a long time. Slowly, she accepted the fact that her body was not at war with her, but was actually giving her subtle signals to becoming more healthy. Over the years, as she listened, she became more attuned to her body’s needs and has managed to overcome a lot of her personal health problems, including thyroid and weight issues. She now teaches others to connect with their bodies and in turn, help them lead healthier and more fulfilling lives. The book covers both her experiences as well as various tips to listen to our bodies. One example is her COAL protocol – Connect, Observe, Ask and Learn. It means to first quieten our thoughts, observe the signals the body is sending, and see what it is conveying to you. A drawback of the book is that it is a little repetitive and the reading flow not that smooth. The material also isn’t entirely new, but there is a lot of honesty and enthusiasm that shines through. You can’t help but attempt a try at her techniques. Books like these are, I think, very relevant in current times when it is extremely easy to turn to the millions of available distractions as soon as we feel even a trifle bit uncomfortable. A lot of us never really listen to our bodies. For that matter, we never even consider that the body has something to teach us, wisdom from millions of years. From my end, I will wholeheartedly support a course in school to teach this skill! To know more about her, do visit her website or check out the e-version of her book on Amazon. Thanks Deepak. I would suggest you read the book. PINNED your review. Thank you. Thank you so much for your heartfelt review Pranav! I am so touched you connected with my story and that the honesty resonated with you! Love your blog and all the amazing writing in here!